Introversion updated their somewhat controversial resource management sim, Prison Architect, last night, after saying the August 2016 2.0 update would be final. 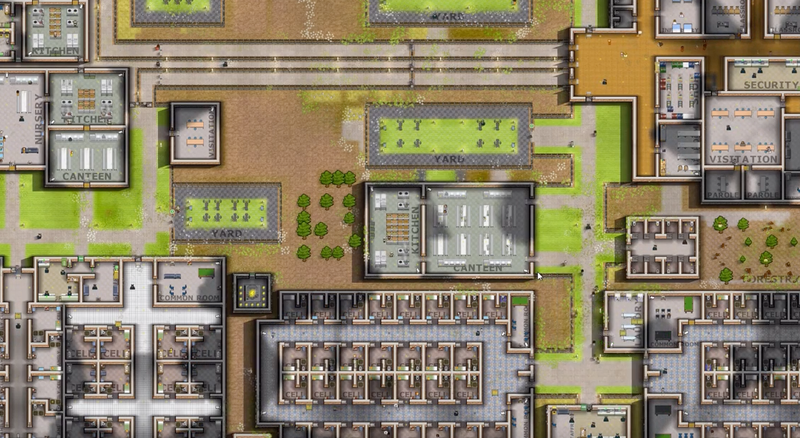 The new update adds a gameplay option for the prison staff to have their own set of needs, requiring them to eat, take breaks, and have time for recreation. Now, if staff needs are turned on, they’ll need to eat, use the bathroom and have time for recreation, just like prisoners. If their needs aren’t met, their discomfort and frustration will cause them to do worse at their jobs and add to the overall “temperature,” of your prison, making it a less safe place for everyone. On why this wasn’t an aspect of the game from the start, Delay and Morris said, “We thought from a gameplay standpoint that it was better if the staff were automatons, and the prisoners were where all the magic happens.” But after the game had been in development for so long, they thought that the players had enough information to be able to parse and attend to the additional needs of staff. On top of that, the way staff needs will affect your prisons will be substantially different from how prisoner needs do. “If the staff are unhappy, they’re not going to start punching all the toilets and riot, are they?” said Delay and Morris. Delay and Morris mention while explaining the update that prison guard safety is an issue in the UK, where Introversion is based. Indeed, last month the UK Prison Officer’s Association went on a 24 hour strike over safety concerns.